Miss Ima Hogg was a charismatic civic leader and visionary philanthropist who called Houston home for 60 years. She also cared deeply about the mental, physical and spiritual well-being of children, serving on the Houston school board and supporting a variety of children’s programs and services in the arts, in health and in education. Before she died, Miss Ima established an endowment at the Hogg Foundation to provide mental health services for children, youth and their families in Houston and Harris County. The fund was activated after her death. Since 1976, the Ima Hogg endowment has funded 167 grants totaling more than $28 million. 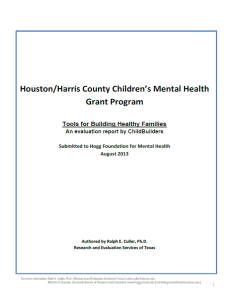 As directed by Miss Ima, the fund may only be used to support mental health services for children, youth and their families in Houston and Harris County. The Hogg Foundation awards grants from the Ima Hogg endowment through a competitive proposal process. 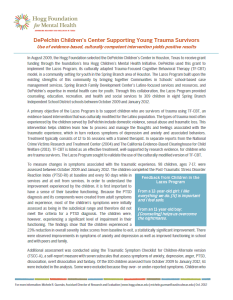 In 2009, the foundation awarded eight three-year grants totaling $7.8 million to provide mental health prevention, early identification and intervention, and treatment services in schools and community settings such as day care and transitional living centers. The programs involve 27 local nonprofit and government agencies and will serve an estimated 10,000 children and youth in high-need areas of Houston and Harris County. The grant program ended in August 2013. Below is a selection of evaluation reports submitted by five of the grantees. Tools for Building Healthy Families a project to implement evidence-based mental health promotion/primary prevention programs for high-risk Head Start preschool children, parents, and faculty. 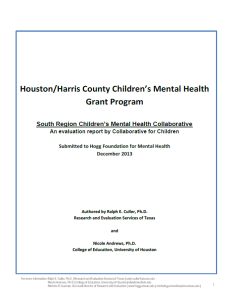 South Region Children’s Mental Health Collaborative, an inter-agency partnership of five Houston area service providers that serves children’s developmental, social, emotional and mental health needs through an integrated systems-of-care model in Houston Independent School District’s South Region. The Lazos Program, a project to implement an evidence-based culturally competent intervention to support Latino children in the Spring Branch area of Houston. 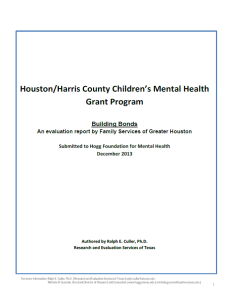 Evaluation of Building Bonds, a project that addresses the mental health needs of children between infancy and five years of age who are at risk for or are experiencing problems with brain development. 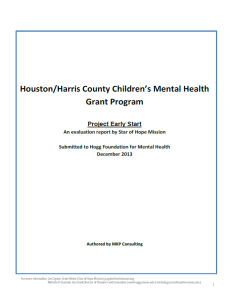 Evaluation of Project Early Start, a project that provides homeless pre-school children with structured programs to enhance their mental, physical and social development.